Red-tailed hawks are common in the Northern USA and they are smart and highly trainable. This bird is a bird of prey also named in the US as “chickenhawk”. These hawks are opportunistic feeders, mainly small rodents sometimes birds and reptiles. Despite belief a standard size chicken is not known to fall into their prey. 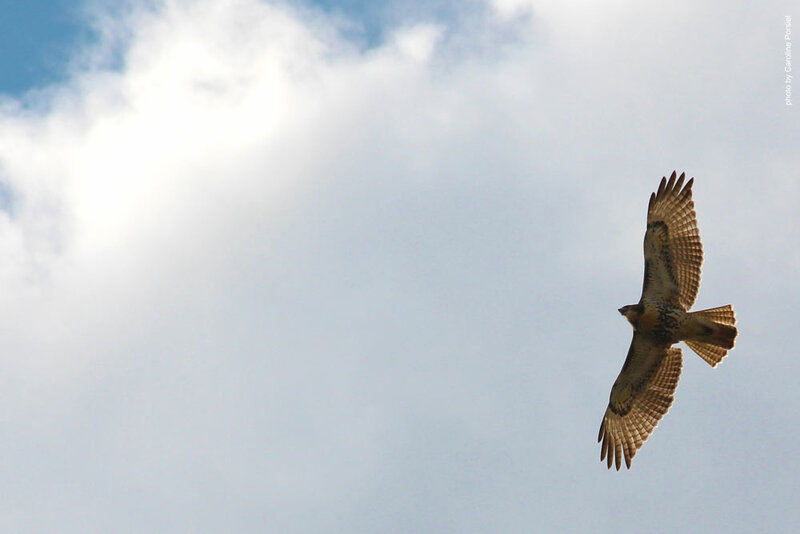 The red-tailed hawk family counts fourteen recognized subspecies. In North America is one of the largest members of the genus Buteo, it weighs from 690 to 1,600 g (1.52 to 3.53 lb) and measures 45–65 cm (18–26 in) in length, its wingspan varies from 110–145 cm (43–57 in). When these large birds are soaring or flapping their wings, they typically travel from 32 to 64 km/h (40 mph), they exceed speed up to 190 km/h (120 mph) when diving. Red-tailed hawks are known for being smart, tameable and trainable, one reason why they are popular birds for falconry. For many American indigenous people the feathers of the red-tailed Hawks have been sacred. Similar like feathers from bald eagles the tail feathers have been a popular item in Native American communities. Please note that also the feathers of red-tailed hawks fall under the reglulation of the “eagle feather law” allowing only certain authorized persons to obtain feathers.